Pahan Ranasingha stands Monday in the hangar of his building at Avionics Installations at the Spruce Creek fly-In in Port Orange, Florida. PORT ORANGE —With more than 600 flying machines based at the Spruce Creek Fly-In, it's no wonder several aircraft businesses choose to call it home. With a 4,000-foot runway as the community's centerpiece and about 13 miles of taxiways leading to homes — some where you can almost slide out of the cockpit into your dining room — the gated community is one-of-a-kind and a natural fit to aviation businesses that have discovered the benefits of a home-grown customer base. The land under the Port Orange-area community was originally a U.S. Naval Air Force training facility during World War II, but after the war ended the property was left vacant and it attracted vagrants and teenagers looking for a party spot. A group of five investors became interested in the property back in the late 1960s and decided to purchase it in the mid-'70s with the intent to create an airplane-friendly community. Another developer, Jay Thompson of Thompson Properties, bought the Spruce Creek Fly-In when it was for sale in the late '80s. Now, the once-abandoned air park has become a haven for what residents call "toy enthusiasts," and that concentrated interest makes for a business niche like no other. 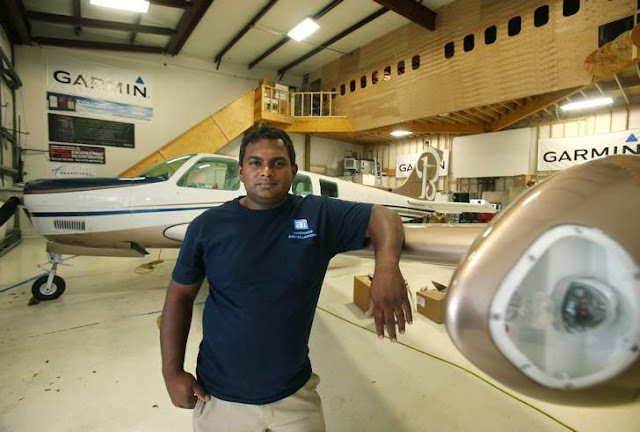 Pahan Ranasingha, owner of Avionics Installations Inc., opened up his firm in 1991 and works out of a Fly-In hangar on Cessna Boulevard. Since that time, the firm's seven employees have had a constant stream of work at the two Fly-In commercial hangars he owns. So much so he was running out of space, but since the taxiways prevent a build-out, Ranasingha hired local contractor Mike Ceralosi to custom build an office inside the hangar that would still allow planes in. Ceralosi came up with a design to make the office space at 212 Cessna Blvd. look like part of the fuselage of an old Boeing 747 Jumbo Jet and anchored it to the wall diagonally — 16 feet off the ground and out of the way of his employees. Ranasingha, who incorporated his digital avionics, navigation and communication installation company in 1993, says being at the Fly-In has been the perfect location for him, in part because of his proximity to other aircraft machinists like Michael Collier, who operates an aircraft composite construction firm called Fibercraft in the Fly-In, across the taxiway from Avionics Installations. Collier employs five workers who work with composite materials to build experimental aircraft, many of them one-of-a-kind. Case in point: one mock-up he and his crew designed included a fishing dock. Collier started his business in Oregon in 1999. He relocated it to the Fly-In in 2012. The location just made sense, he said. Most of my customers travel along the East Coast and the Fly-In is more convenient for them, he said. In addition to building machines and kit planes from scratch and making body modifications, Collier has added inspections to the list of services offered. But before each of those inspections is made by Collier's company, Federal Aviation Administration rules state they have to be spick-and-span. Rayne started a detailing business in the Fly-In two years ago when he realized all aircraft had to be cleaned before each annual inspection and every 100 hours of flight as part of the FAA's maintenance and safety regulations. While there is no rule against cleaning your own plane, it's a time-consuming process, which gave Rayne the idea to open up shop in the community. Rayne's company, Aerodyne Detail LLC, cleans, polishes and restores aircraft and business has been booming. His firm takes care of more than 150 aircraft on a revolving basis, but it didn't start out easy. Rayne went to school to get his license to become an aircraft mechanic a few years back. Since it takes at least three years to become certified to do inspections on aircraft and his mechanic work wasn't exactly taking off, Rayne said he was keeping his eye out for other avenues to keep the bills paid and he came across the FAA inspection regulation. He said that was the catalyst for deciding the Fly-In would be his niche. At the time, since money was pretty tight, getting into the community to start his business was a leap of faith. "When I got there I didn't know anybody," Rayne said. "It was kind of a roll of the dice to get in there and really see if I could make the business successful." But now that he's spent time in the Fly-In, "Now it's happening," Rayne said. "We get new customers every month. It just keeps growing and growing." Commercial space or hangar space can be rented at the Spruce Creek Airport or you can be mobile. But while you don't have to own property within the super high-security community to do business there it certainly helps. Rayne says having that network surrounding him where he lives is the main reason his firm is so busy. "We know each other more than the average community does," said Rayne, who said that while 90 percent of his detailing work is done within the confines of the community, the other 10 percent is done at large air shows like the National Championship Air Races in Reno, Nevada, and the EAA AirVenture in Oshkosh, Wisconsin, where he follows his clients. "We're supporting people that are our neighbors," he said. "Being inside Spruce Creek (Fly-In) really does lend a lot to your credibility," Rayne said. On the other hand, "You've really got to bring your A-game if your going to be doing business in there," he said. "People will just basically ignore you if you're no good." Rayne said he has customers bring him airplanes to detail from as far away as New Hampshire and considers that an honor and gauge of his success. "If you're doing business and you're doing business well inside the Creek, then you're doing alright," he said. 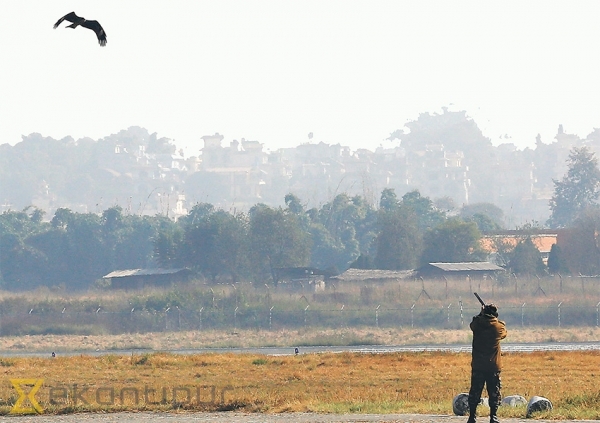 An official at the Tribhuvan International Airport aiming at a bird. On October 9, 1996, a Thai Airways Flight 312 bound for Bangkok narrowly escaped a major mishap when it slammed into a group of vultures during take-off from Tribhuvan International Airport (TIA). The Thai pilot acted very calmly and continued with the predetermined take-off procedure. Once the Airbus 330-600 had stabilized in the air, he turned around and made an emergency landing at the TIA. The jet was carrying 228 persons including the crew. The passengers were unharmed. However, five dead vultures were recovered from the impact site, and one of the aircraft’s engines was severely damaged, requiring it to be grounded for several days. The incident was front-page news in The Kathmandu Post. ‘Thai jet survives major mishap’, the headline screamed. One American passenger named Matt Carpenter even got the entire crew to sign autographs on a copy of the newspaper. Bird hazards are a constant threat at the TIA, especially from September to November. During those months, earthworms come out of the grass seeking warmth and die on the runway. This attracts vultures that come to feed on the abundant supply of earthworms. There used to be landfill sites, garbage dumps and uncontrolled commercial activities close to the runway which attracted birds, creating a great nuisance for flight operations. I was one of the air traffic controllers (ATC) on duty that day and I vividly remember the intense bird activities around the TIA. All the available techniques and resources had been deployed to scare away the birds, and helicopters were even requested to hover over the runway. The airport’s fire hoses were also used to drive them away. But the vultures were very adamant. They would fly a short distance before returning to the runway. An Indian Airlines (IA) flight from Delhi was inbound even as the airport was encountering intense bird activities. The pilots opted to land despite the warnings of the ATCs. Fortunately, the landing was safe. After landing, the upset IA pilots requested us to get rid of them before their next flight. It was very unfortunate that they did not know about the ground team’s enormous efforts to keep the runway clear. About half an hour after the IA flight landed, Thai Flight 312 requested clearance for takeoff. The ATC informed the pilots about the severe bird activities around the airport. Since Thai Airways was very particular about maintaining their schedule, they decided to depart in spite of the precarious bird activities. It was evident that the ATC was not comfortable with issuing a clearance to Flight 312. During such difficult circumstances, junior ATCs usually seek their supervisor’s help to deal with the situation. The supervisor had to take over and started giving authoritative instructions to the pilot though the airport was not closed. A year after the Thai incident, I was working as the supervisor at the control tower. There was high level of bird activities around the TIA, and I was feeling a bit apprehensive as I recalled the Thai incident. As usual, all the efforts to scare away the birds failed. In the meantime, there was an Aeroflot flight inbound from Moscow. The Aeroflot aircraft was informed well in advance about the hazardous bird activities at the TIA. The ground team was struggling hard to shoo away the birds before the plane arrived, but all their efforts were in vain and bird activities became even more intense. They reached an alarmingly critical level as the Aeroflot flight was nearing Kathmandu. I consulted my seniors about closing down the airport, but no one wanted to be involved in taking such a decision. Ultimately, I took the unprecedented action of closing down the airport. The Aeroflot jet circled over Kathmandu for a few minutes and then headed for Delhi as there was no sign of improvement. The next day, the Aeroflot flight landed in Kathmandu with its Delhi-based senior executive officer on board. As soon as the aircraft landed, he headed straight to the general manager of the TIA to submit a formal letter asking for compensation for the loss caused by the flight’s diversion. I was immediately summoned by the general manager and asked to explain my actions. I had a very tough time convincing them as nobody made an attempt to understand the real circumstances. I did feel very sorry for closing the airport. However, my decision had been right and it set a precedent. Over the last several years, there have been significant improvements in the TIA’s Air Traffic Control system. The Licensing and Rating system has been introduced and the ATCs are paid a fair compensation in terms of Rating Allowance and Stress Allowance. All those positive changes have helped to improve the confidence and morale of ATCs. Most importantly, as far as safety is concerned, ATCs have high professional confidence and do not hesitate to intervene and use their authority when the situation warrants it. Bird strike problems at airports are universal in nature and not unique to the TIA. Even though every possible technique is employed to prevent bird strikes, a number of incidents are reported every year. The instrument-rated private pilot and two passengers departed on an instrument flight rules flight plan in low instrument meteorological conditions (IMC), including fog and cloud ceilings at 200 ft above ground level. Before takeoff, the pilot announced on the airport's common traffic advisory frequency that the airplane was departing runway 19; however, the airplane departed runway 27. Radar data indicated that the airplane made 3 nearly 360° left turns in close succession just before ground impact. The airplane's altitude during the turns varied between 1,200 ft and 1,800 ft msl. Examination of the airframe and engine did not reveal any anomalies that would have precluded normal operation, and data retrieved from onboard engine monitoring equipment indicated that the engine was operating normally throughout the flight. Conditions conducive to the development of spatial disorientation existed at the time of the accident, including restricted visibility, entry into IMC, and maneuvering for an assigned course after takeoff. It could not be determined whether the pilot recognized his error in departing from the incorrect runway, but it is possible that this error presented the pilot with an operational distraction about the time the airplane was entering IMC, and could have precipitated the pilot's spatial disorientation. Additionally, the pilot had reported to the airplane's co-owner the day before the accident that the airplane's autopilot was inoperative and that he did not plan to use it. Thus, the pilot did not have the autopilot available to help manage his workload during the flight. The radar depiction of the accident flight path was consistent with the known effects of spatial disorientation, and it is likely that the pilot became disoriented shortly after entering IMC after takeoff. The pilot's loss of control due to spatial disorientation shortly after takeoff into low instrument meteorological conditions. On August 30, 2015, about 0918 central standard time, a Cirrus SR22 airplane, N765CD, was destroyed when it collided with terrain shortly after takeoff from Kewanee Municipal Airport (EZI), Kewanee, Illinois. The private pilot and one passenger were fatally injured; the second passenger sustained serious injuries. The airplane was privately owned, and the personal flight was operated under the provisions of 14 Code of Federal Regulations Part 91. Instrument meteorological conditions prevailed throughout the area, and an instrument flight rules (IFR) flight plan was filed for the cross-country flight, with an intended destination of Hot Springs, Arkansas. A family member drove the pilot and passengers to EZI at 0745. During the short drive, the pilot discussed the fact that the airplane's autopilot had stopped working during the flight to EZI a few days before. The pilot thought that this would make the trip a little harder but that it was not a critical system preventing his departure. The pilot said that he initially planned to fly under the clouds then climb above the clouds to his desired cruise altitude of 11,000 ft. Upon arriving at the airport, the pilot decided to delay the flight due to the amount of fog in the area. The pilot and passengers subsequently returned to the airport about 0900 for departure. There were no witnesses to the accident and no distress calls were broadcast via radio. According to Flight Service, the pilot called before takeoff to file an IFR flight plan. He was given clearance to take off with a void time of ten minutes to activate the flight plan. The airport manager reported that the pilot taxied for takeoff on runway 27; however, the pilot's radio calls indicated that he thought he was using runway 19. After an aborted takeoff, the pilot completed a back-taxi on runway 27, but again his radio calls were for runway 19. The airplane subsequently departed runway 27. The surviving passenger, who was seated in the left rear seat, stated that the aborted takeoff was due to an open door. After securing the door, the airplane subsequently departed. She stated that when the airplane took off, it went quickly into the clouds. She stated that it did not feel as if the airplane was "going up." She stated that she heard a discussion between the pilot and then passenger seated in the front seat: the front seat passenger had reached for the activation handle for the airframe parachute system, and the pilot stated that the airplane was "too low." She then saw the ground approaching, and the impact occurred. According to radar data obtained from the Federal Aviation Administration (FAA) Quad City Terminal Radar Approach Control facility, identified targets corresponded with the accident airplane's assigned transponder code. Additionally, five subsequent primary targets were consistent with the track of the accident airplane. There were no other aircraft operating in the immediate vicinity. The radar data corresponding to the airplane's transponder code began at 0914:53 at a Mode C reported altitude of 1,500 ft after the airplane departed EZI. The target continued in a left turn to the west and south and climbed to an altitude of 1,800 ft before beginning a descent to 1,200 ft. That data ended, and the primary radar returns consistent with the accident airplane begin at 0915:37 and continued until the last associated target at 0916:35 and an altitude of 1,600 ft. EZI airport elevation was 858 ft. A flight path superimposed between the primary targets suggested that the pilot made three nearly 360° left turns in close succession before impacting the ground. See figure 1. The pilot held a private pilot certificate with ratings for airplane single-engine land and instrument airplane. His most recent FAA third-class medical certificate was issued on August 14, 2014. Review of the pilot's logbooks indicated a total flight experience of 922 hours of which 37 hours were in the accident airplane make and model. The pilot completed a Cirrus Advanced Transitional Instrument Training Course in May 2015. The pilot had logged 130 hours of actual instrument flight experience and 94.1 hours of simulated instrument experience. In the 90 days before the accident, the pilot logged 3.1 hours simulated instrument experience and 4.8 hours actual instrument experience, all of which were in the accident airplane make and model. The airplane's most recent annual inspection was completed on March 5, 2015, at a Hobbs meter time of 1,635.1 hours. On June 25, 2015, at a Hobbs time of 1,635.2 hours, a new Engine Data Management System was installed. The aircraft logbook included an entry stating that the Cirrus Airframe Parachute System (CAPS) was replaced on October 4, 2011, at a Hobbs time of 1,134.2 hours. At the time of the accident, the Hobbs time was 1,734.8 hours. The co-owner of the airplane reported that he had flown the airplane 9 days before the accident. He reported that there were no problems with the aileron trim or the autopilot. He flew using GPS navigation and with the autopilot engaged for the entire flight. The 5.4-hour flight had 3 occupants onboard with 50 pounds of baggage. He also stated that he had talked to the accident pilot the morning before the accident. The pilot told him that the autopilot would hold altitude, but it would not hold the horizontal situation indicator (HSI) heading bug or the GPS. The pilot also told him that the trim on the sidestick was not working and that he could hold straight and level flight with a bit of right aileron. The co-owner and pilot agreed to have the trim looked at upon his return flight. A family member reported that he and the pilot had flown the airplane on a local flight from EZI for about 15-20 minutes on the morning before the accident. He reported that the flight was normal and that they did not experience any problems. First responders reported foggy conditions and low cloud ceilings about the time of the accident. EZI listed no official weather reporting capability; however, an unofficial weather station was collocated at EZI and reported the following conditions at 0910: wind from 090° at 1 knot, temperature 18.9°C, dew point 18°C, relative humidity 99%, altimeter 30.11 inches of mercury (Hg). Visibility and sky conditions were not reported. The closest reporting station to the accident site was from Galesburg Municipal Airport (GBG), Galesburg, Illinois, located 28 miles southwest of the accident site at an elevation of 764 ft. The airport had an Automated Weather Observation System (AWOS), which issued observations every 20 minutes. The 0915 observation included: calm wind, visibility 1 miles in mist, ceiling overcast at 200 ft, temperature and dew point 19°C, altimeter 30.09 inches of Hg. A review of the observations for the day indicated that IFR conditions were reported as early as 2215 the previous evening, with low ceilings and visibility in fog and mist continuing through the time of the accident, and clearing by 1115. A weather study was completed by a NTSB staff meteorologist and is referenced in the public docket to this report. Examinations of the airframe and engine were accomplished at the accident site and a secured hangar located at the Kewanee Airport. The accident occurred in a planted soybean field, about 1.5 miles west of the Kewanee airport. The airplane impacted terrain in an approximate 45° nose-down, right-wing-low attitude on a heading of about 130-140°. The debris field extended to the east about 260 ft from the initial point of impact on a headings from 080 to 110°. The main wreckage came to rest on a heading about 190°. An examination of the ground impact scars and debris path showed that the tip of the right wing struck the ground at the western end of the debris field. The scar from the right wing tip was the initial point of impact. Propeller cuts, dirt clumps, and an impact depression were noted in the soft soil about 38 to 45 ft from the initial impact point. The separated propeller was located at 55 ft, and the right cabin door was located at 65 ft. The tip of the right wing and aileron were at 67 ft. The upper engine cowling was at 72 ft and the lower engine cowling was at 78 ft. The CAPS enclosure cover was at 75 ft. The left cabin door was at 120 ft, the main wreckage was at 160 ft, and the engine was at 185 ft. The parachute was stretched out on a heading of 110° to about 240 ft. The CAPS D-Bag and rocket motor were at 260 ft. The fuselage was mostly destroyed by impact forces. The lower forward fuselage was crushed up and aft. The firewall was separated from the fuselage and the upper engine cowling was separated from the fuselage. The right forward corner of the upper engine cowling was crushed aft about 25°. The lower left and right engine cowlings were fractured into several pieces. The forward fuselage was fractured and crushed aft. The spar cover was separated from the fuselage. Both front seats remained attached to the spar cover. The rear section of the cabin floor was separated from the fuselage and the rear seats remained attached to it. The wing was mostly destroyed by impact forces, and the wing spar was fractured in multiple places. All upper and lower wing skins were separated from the wing spar. The left and right flaps were separated from the wing. The right aileron was separated from the wing, and the left aileron remained attached to the wing. Aileron control cable continuity was confirmed. The roll trim motor shaft was found fractured. The fractured end of the roll trim motor shaft remained attached to the roll trim cartridge. The roll trim cartridge remained attached to the left aileron actuation pulley. Two rub marks were located adjacent to the roll trim motor mounting location. One rub mark was on the roll trim motor access panel, and one rub mark was on the lower wing skin. It could not be determined when the rub marks occurred. The flap actuator was separated from the flap torque tube. The flap actuator shaft was located in a position extending approximately 2 inches, consistent with a "Flaps 50" position. The empennage was separated from the fuselage about 1 ft forward of the leading edge of the horizontal stabilizer. The rudder remained attached to the vertical stabilizer and rudder control cable continuity was confirmed. The right elevator remained attached to the horizontal stabilizer and the right elevator tip exhibited impact damage. The left elevator remained attached to the horizontal stabilizer and the left elevator tip was separated from the elevator. Elevator control cable continuity was confirmed. The pitch trim motor was in an approximate neutral position. The nose landing gear assembly was buckled aft under the engine. The nose landing gear upper weldment remained attached to the engine mount. The nose landing gear leg, tire and wheel assembly was separated from the nose landing gear upper weldment. Both the left and right main landing gear assemblies exhibited impact damage. Both main landing gear assemblies remained attached to the wing. The right and left cabin doors were separated from the fuselage. Both door's upper and lower pins exhibited impact damage. The baggage door remained attached to the fuselage. The instrument panel exhibited impact damage and was separated into two sections. The center console exhibited impact damage. The center console was equipped with a Garmin GMA 340 Nav/Com, dual Garmin GNS 430's, S-TEC 55X autopilot, and a Garmin GTX 327 transponder. The ignition key remained in the ignition switch and the ignition switch was in the "Both" position. The bolster panel in front of the left crew seat was modified with a JPI Engine Data Management System. The instrument panel in front of the right crew seat was modified to accept a Garmin GPS map 696, which was installed. • Hobbs meter indicated 1,734.8 hours. • Altimeter's Kollsman window indicated a setting of 30.01. • Flap switch was in the flaps "100" position. • GPS #2 circuit breaker was in the "open" position. • Encoder/transponder circuit breaker was in the open position. • MFD circuit breaker was "zip-tied" in the "open" position. • Strobe and landing light switches were in the "on" position. • Strobe lights circuit breaker was in the "open" position. • Battery #2 circuit breaker was in the open position. • Battery #1, Alternator #1 and Alternator #2 master switches were in the "on" position. Both front seats remained attached to the spar cover. First responders cut the left seat belt webbing to aid in the extraction of the left seat occupant. The separated left seat belt remained buckled together. The right seat belt was found unbuckled. The right seat belt webbing exhibited load damage. The right seat belt webbing was torn and partially pulled through the load bar. The left rear seat belt remained buckled together. The left rear seat belt webbing exhibited load damage and was crushed and gathered against the load bar. The forward section of the roof and the windscreen were separated from the fuselage. Impact damage was noted on the roof structure directly above and adjacent to the mounting location of the CAPS activation handle and holder. The CAPS activation handle was found out of the activation handle holder. The activation handle holder bracket was bent aft. Impact damage was noted on the activation handle and on the exposed activation cable. The CAPS safety pin was located on the ground under the main wreckage. The CAPS was found deployed and the CAPS rocket motor propellant was expended. The CAPS rocket motor, rocket lanyards, incremental bridle, D-Bag, suspension lines, riser, rear harnesses and both front harnesses had been extracted from the airplane. The rear harness remained snubbed. Both reefing line cutters remained in place and both had been activated. The parachute was separated from the D-Bag and was found stretched out from the main wreckage on a heading about 110°. The slider was at the base of the canopy. Packing folds were present on the canopy. The rocket motor, lanyards, incremental bridle and D-Bag were located approximately 20 ft beyond the end the parachute. The CAPS launch tube, rocket igniter, exhaust shield, and base remained attached to the bulkhead. The retention straps for the D-Bag remained in the enclosure compartment. The CAPS access panel (#CB7) exhibited impact transfer marks from the left front harness 3-point link. The CAPS enclosure cover was located approximately 20 ft south of the debris path at a point about 75 ft from the right wing tip ground scar. An impact transfer mark, consistent in size and dimension with the top of the CAPS rocket motor, was noted on the inside surface of the cover, on the "strike plate." On-site observations of the CAPS system showed that the system was not activated in flight. All evidence correlated to a CAPS deployment as the result of impact forces. The crankshaft propeller flange was fractured and remained attached to the propeller hub. All of the cylinders remained attached to the crankcase and exhibited impact damage. All damage observed was consistent with impact. The fractured crankshaft propeller flange and radii exhibited 45° shear lips and spiral cracking. The exhaust and induction systems exhibited impact damage. Both magnetos remained attached to the engine. Rotation of the engine by hand through the accessory drive produced impulse coupling engagement from both magnetos. The magnetos produced spark on the top spark plug leads for cylinder Nos. 2, 4, 5 and 6. The ignition harness was severed at the magneto due to impact damage, which contributed to the lack of spark from the top leads of cylinder Nos. 1 and 3. The ignition harness exhibited impact and thermal damage, and some leads were found cut and severed. The top spark plugs exhibited light- and dark-colored combustion deposits and the electrodes exhibited normal wear. The bottom spark plugs were inspected using a lighted borescope and exhibited normal operating signatures. The fuel pump remained attached to the engine and was removed. The drive coupling was intact and the pump turned freely by hand. The mixture control arm moved freely by hand from stop to stop. The fuel pump was disassembled with no anomalies noted. The fuel manifold valve was removed from the engine and disassembled. The screen was free of debris. A small amount of fuel was observed in the manifold valve cavity. The diaphragm and plunger were intact and the retaining nut was tight. The fuel injector lines exhibited impact damage. The fuel injector nozzles from all cylinders except cylinder No. 2 were removed and free of obstructions. The No. 1 cylinder fuel nozzle was slightly bent. The fuel nozzle for cylinder No. 2 could not be removed due to impact damage. The throttle body remained attached to the engine and exhibited impact damage. The control arm moved freely by hand from stop to stop. The oil sump was crushed upward into the crankcase and breached. The oil pump was disassembled and the drive and driven gears showed no anomalies and were coated with oil. The oil pump cavity contained oil and exhibited no hard particle passage. The oil cooler remained attached to the engine and exhibited impact damage. The cylinders exhibited impact damage to their respective fins and some valve covers. The top spark plugs were removed and the cylinders were examined with a lighted borescope. The combustion chambers contained light-colored combustion deposits. The engine was rotated by hand through the accessory drive, and thumb compression was obtained on all cylinders except cylinder No. 1. A second borescope inspection of cylinder No. 1 revealed dirt and debris from impact located around the exhaust valve seat, preventing full closure of the exhaust valve. The engine was rotated again and proper operation of the No. 1 cylinder valve was visually observed with the borescope. The starter was found in the debris field, fractured and free of the starter adaptor. The three-blade propeller was separated from the engine and located in the wreckage debris field. The spinner exhibited rotational crushing. Two blades were relatively straight and displayed chordwise scratching. The third blade was bent aft approximately midway from the hub to the tip and exhibited chordwise scratches and nicks in the leading edge. Several propeller slash marks were noted in the debris field. The propeller governor remained attached and was removed for inspection. The control arm moved freely by hand from stop to stop. The drive rotated freely by hand and oil discharged from the governor. The governor's gasket screen was free of debris. The Henry County Coroner Office, Cambridge, Illinois, performed an autopsy of the pilot. The cause of death was listed as "Multiple Blunt Injuries." Toxicological testing on specimens of the pilot was performed by the FAA Bioaeronautical Sciences Research Laboratory, Oklahoma City, Oklahoma. Testing for carbon monoxide, ethanol, and drugs were all negative. The airplane was equipped with a Garmin 696 GPS MAP and a JPI EDM 900 Engine Monitoring System. The Garmin 696 was impact damaged and no data was extracted. The JPI EDM 900 was viable and data were downloaded. The data extracted included 71 logs from June 26, 2015 through August 30, 2015. The log for the accident flight began at 09:12:38 CDT and ended at 09:14:43 CDT. Additionally, data from four previous flights were reviewed. All recorded logs showed normal engine operation. 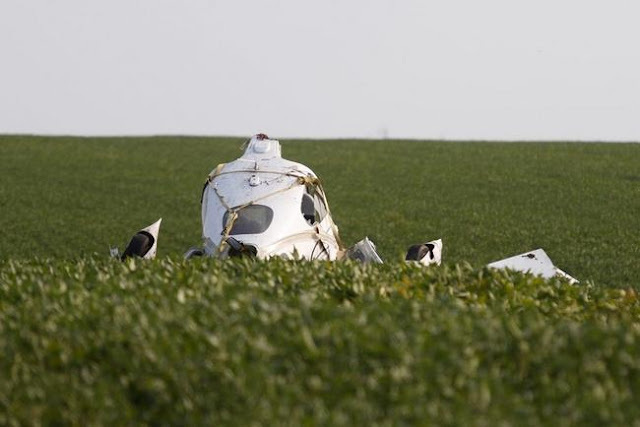 On August 30, 2015, about 0918 central standard time, a Cirrus SR22 airplane, N765CD, registered to private individuals, collided with terrain shortly after takeoff from the Kewanee Municipal Airport (EZI), Kewanee, Illinois. Of the three occupants, the private pilot and 1 passenger sustained fatal injuries and 1 passenger sustained serious injuries. The flight was being conducted under the provisions of Federal Code of Regulations Part 91. Instrument meteorological conditions prevailed throughout the area of the accident and an IFR flight plan was placed on file with a 10 minute void time prior to takeoff. The flight was originating from EZI with an intended destination of Hot Springs, Arkansas. There were no direct witnesses to the accident and no distress calls were received. According to Flight Service, the pilot called prior to takeoff to file an IFR flight plan. He was given clearance to takeoff with a void time of ten minutes to activate the flight plan. Local residents reported foggy conditions and low cloud ceilings about the time of the accident. The surviving passenger who was seated in the rear seat reported that the airplane took off, went quickly into the clouds. She stated that it did not feel as if the airplane was "going up." She looked up, saw the ground approaching, and the impact occurred. The accident occurred in a planted soybean field, approximately 1.5 miles west of the Kewanee airport. The wreckage was located at a position approximately 0.5 miles west of the intersection of North 400th Avenue and East 2250th Street and approximately 250 feet south of the North 400th Avenue. An examination of the main impact site and energy debris path revealed that the airplane impacted terrain in an approximate 45 degree nose down, right wing low attitude, on a heading of approximately 130 to 140 degrees. The debris field extended to the east approximately 260 feet from the initial point-of-impact on a heading from 080 degrees to 110 degrees. The main wreckage came to rest on a heading of approximately 190 degrees. An examination of the impact scars and wreckage debris revealed that the right wing tip struck the terrain at the western end of the debris field. The right wing tip scar was the initial point-of-impact. All subsequent debris measurements are approximate from this point. Propeller cuts, dirt clumps and an impact depression were noted in the soft soil from 38 feet to 45 feet. The separated propeller was located at 55 feet. The right cabin door was located at 65 feet. The right wing tip and aileron was at 67 feet. The upper engine cowling was at 72 feet. The CAPS enclosure cover was at 75 feet. The lower engine cowling was at 78 feet. The left cabin door was at 120 feet. The main wreckage was at 160 feet. The engine was at 185 feet. The parachute was stretched out on a heading of 110 degrees to approximately 240 feet. The CAPS D-Bag and rocket motor was at 260 feet. The forward section of the roof and the windshield were separated from the fuselage. Impact damage was noted on the roof structure directly above and adjacent to the mounting location of the CAPS activation handle and holder. The CAPS activation handle was found out of the activation handle holder. The activation handle holder bracket was bent aft. Impact damage was noted on the activation handle and on the exposed activation cable. CAPS safety pin was located on the ground under the main wreckage. The CAPS was found deployed and the CAPS rocket motor propellant was expended. The CAPS rocket motor, rocket lanyards, incremental bridal, D-Bag, suspension lines, riser, rear harnesses and both front harnesses had been extracted from the aircraft. The rear harness remained snubbed. Both reefing line cutters remained in place and both had been activated. The parachute was separated from the D-Bag and was found stretched out from the main wreckage on a heading of approximately 110 degrees. The slider was at the base of the canopy. Packing folds were present on the canopy. The rocket motor, lanyards, incremental bridal and D-Bag were located approximately 20 feet beyond the end of stretched out parachute. The CAPS launch tube, rocket igniter, exhaust shield, and base, remained attached to FS 222 Bulkhead. The retention straps for the D-Bag remained in the enclosure compartment. The CAPS access panel (#CB7) exhibited Impact transfer marks from the left front harnesses 3-point link. The CAPS enclosure cover was located approximately 20 feet south of the debris path at a point approximately 75 feet from the right wing tip ground scar. An impact transfer mark, consistent in size and dimension to the top of the CAPS rocker motor, was noted on the inside surface of the cover, on the "strike plate." On site observations of the CAPS system showed that the system was not activated in flight. All of the on-site evidence correlated to a CAPS deployment due to impact forces. Additionally, the surviving passenger stated that she heard a discussion between the pilot and passenger seated in front. She stated that the front seated passenger had reached up for the CAPS handle, and the pilot said that "we were too low." The aircraft was recovered and more detailed examinations of the airframe and engine were conducted in a secure hangar located at Kewanee Airport. The results of these examinations will be included in the final report. The aircraft was recovered and more detailed examinations of the airframe and engine were conducted in a secure hanger located at Kewanee Airport. The results of these examinations will be included in the final report. TOULON — The victims of a plane crash west of Kewanee on Sunday had flown to the area to attend a family inurnment ceremony Saturday. Local family members confirmed Monday that Steven Murray, 67, Houston, Texas, was the pilot of the small private aircraft that crashed after leaving the Kewanee Municipal Airport. Murray, his son Mark Murray, 38, and daughter Samantha Murray, 40, had flown in last week to attend a family memorial service. Steven and Mark Murray were pronounced dead at the scene of the crash on Sunday by Henry County Coroner David Johnson. Samantha Murray was transported by ambulance to OSF St. Luke Medical Center in Kewanee before being transferred to OSF St. Francis Medical Center in Peoria. She sustained a broken arm, cuts and bruises, and remains in stable condition. Steven’s father, Dr. Haydn H. Murray of Bloomington, Ind., passed away in February. With local ties to the community, the family held the inurnment ceremony for Murray in Elmira Cemetery. Murray was born in Kewanee and married his high school sweetheart, Juanita Appenheimer. He became a world-renowned geologist and was a longtime professor of geology at Indiana University. Steven and his children attended the service Saturday and visited relatives in the Toulon area before leaving for home Sunday morning. Steven is the nephew of Dorothy Schmidt and a second cousin to Doug Murray, both of Toulon. The plane crashed around 9:35 a.m. in a soybean field 2 miles west of the airport on Galva Township Road 400N. A nearby farmer heard the crash and called authorities. Responding were the Henry County Sheriff’s Department, District 7 Illinois State Police, Galva police, Bishop Hill and Galva fire departments, Illinois Emergency Management Agency and the Stark County Ambulance Service. Rural roads in the vicinity were closed to traffic while the crash was being investigated Sunday. UPDATE: A woman is now listed in fair condition after a deadly plane crash. It happened Sunday morning in a field outside of the Kewanee Municipal Airport in Henry County. Steven Murray and Mark Murray, a father and son, were pronounced dead at the scene. Another family member Samantha Murray, 40, was taken to OSF Saint Francis Medical Center with an arm injury, cuts and bruises. Samantha Murray’s 41st birthday is reportedly September 1st. The National Transportation Safety Board is wrapping up its investigation Monday into why the small plane crashed. An autopsy on Steven and Mark Murray is scheduled for Tuesday in Peoria. ORIGINAL: Two men are dead and a woman is in the hospital Sunday after a plane crash. Police say it happened just before 10 o'clock Sunday morning. A small plane crashed in a field outside the Kewanee municipal airport in Kewanee, Illinois. The Murrays were in town for a family gathering when something went terribly wrong. "They were leaving this morning from the Kewanee airport and they were going to go back to Texas," said David A. Johnson, Henry County Coroner. Johnson said when he arrived on scene 67-year-old Steven Murray and 38-year-old Mark Murray, a father and son, were pronounced dead at the scene. Another family member, 30-year-old Samantha Murray was taken to an area hospital with an arm injury, cuts and bruises, but later airlifted to a hospital in Peoria. Her condition is unknown at this time. Authorities on scene say that North 40th avenue, where the crash happened will remain closed, as the National Transportation Safety Board completes their investigation Monday morning. Then the aircraft will be taken to a secure location, where they will look further into what caused the crash. “It's really no different than a larger aircraft it's just on a smaller scale so they do the same procedures to figure out what the cause is and what caused the aircraft to go down,” Keenan Campbell, Director of Bureau County Emergency Management. On Tuesday morning, an autopsy will be conducted for Mark and Steven Murray in Peoria. A father and son from Houston, Texas, were killed Sunday in a plane crash west of the Kewanee Municipal Airport. The crash of a Cirrus SR22 aircraft occurred at 9:30 a.m. Sunday. Steven Murray, 67, and his 38-year-old son, Mark Murray, were pronounced dead at 12:45 p.m. by Henry County Coroner David A. Johnson. Another passenger, Samantha Murray, 40, who is believed to be Steven Murray's daughter, was taken to Kewanee Hospital for treatment, and then airlifted to OSF St. Francis Medical Center in Peoria, Mr. Johnson said. The group was visiting the area for a family gathering and took off from the Kewanee airport Sunday morning to head back to Texas, he said. The Bishop Hill Fire Department and Illinois State Police responded to the crash, as well as a representative from the Federal Aviation Administration from Chicago. The FAA and National Transportation Safety Board will lead the investigation, Mr. Johnson said. Kewanee: Two Texas residents were killed when a small plane crashed in rural Kewanee Sunday morning. Emergency crews were dispatched to the scene shortly after 9:30 a.m. when a local resident reported the accident. Pronounced dead at the scene at 12:45 p.m. Sunday by Henry County Coroner David Johnson were Steven Murray, 67, and his son Mark Murray, 38, both of Houston, Texas. A third victim, Samantha Murray, 40, was transported by ambulance to Kewanee’s OSF St. Luke Medical Center and then air-flighted to a Peoria hospital. Johnson said Samantha Murray, also of Houston, sustained injuries to an arm. The plane’s wreckage was in a soybean field two miles west of Kewanee Municipal Airport on 400N. Johnson said the three victims had been in this area for a family gathering over the weekend and were returning home. The plane had left from the Kewanee airport prior to the accident. Illinois State Police Officer Steve Icenogle said a nearby farmer heard the crash and saw a cloud of smoke. He found the downed plane and called authorities. Responding were the Henry County Sheriff’s Department, District 7 Illinois State Police, Bishop Hill and Galva fire departments, Illinois Emergency Management Agency and the Stark County Ambulance Service. Federal Aviation Administration (FAA) officials from Chicago were expect to arrive later in the afternoon to assist with the investigation, as were representatives of the National Transportation Safety Board in Colorado, who were due to arrive late Sunday night. Emergency personnel remained at the scene throughout the day and closed the area off to local traffic. HENRY COUNTY, Ill. (KWQC) – Two men from Texas were killed and another woman, also from Texas, was injured when their small plane crashed this morning between Bishop Hill and the Kewanee Airport at North 400 Avenue and East 2350 Street. According to Henry County Coroner, David Johnson, the crash happened before 9:30 a.m., Sunday, August 30, 2015. Johnson arrived on scene around 12:30 p.m where he said 67-year-old, Steven Murray and 38-year-old, Mark Murray were pronounced dead at 12:45 p.m. Johnson said he believed the two were a father-son pair from Houston, Texas. The third passenger, 40-year-old Samantha Murray was also from Houston, Texas, Johnson said. She was taken to a hospital in Peoria and is being treated for an arm injury. Johnson said they had been in the area for a family gathering, and just taken off from the Kewanee Airport to return home when the crash happened. The Federal Aviation Administration from Chicago is on the scene along with the Bishop Hill Fire Department and the Illinois State Police. Johnson said the National Transportation Safety Board is also expected to arrive from Colorado tomorrow to assist with the investigation. Crews are asking for people to stay clear of the area as it is being investigated.